So, it's been about 5 months since I've been married now, and everyone knows getting married comes with name change. Let's just say this is one thing that I have been intentionally ignoring for a while now. My philosophy was it's not a big deal and I'll get to it when it pleases me. I mean unofficially I am Mrs. (insert hubby's last name), but officially, I am still Mrs. (insert maiden name). Hubby is aware of the fact that I am yet to change my name. I always have one excuse or reason that seems legitimate at the time so it just gets brushed aside. And don't even get me started on the long process. In mind it seem like a daunting task, going from one government office to another and making endless phone calls to companies to update my information. That was all well and good until the topic came up again casually in our conversation and as always, I was quick to defend myself and give multiple reason why I still haven't taken the first step. Well, from the tone in hubby's voice, I could tell my excuses were no longer flying. And, to beat me to it, he had an answer for every single one of my excuses. Honestly, I think deep down inside I wish the unofficial name change was enough. Everyone know me as Mrs. (insert hubby's last name) now, and I also changed my social network media to reflect that. But the truth is that isn't enough. I've even had moments when I thought I could keep my maiden name just because....well I can. sometimes, it is the smallest things in life that gets the best of us. I mean, I had no trouble, no thinking twice, no fidgeting, no cold feet getting married and calling this man my husband in front of 250 family, close friends, friends of family, friends of friends and the others unknown ;) So, why is the thought of presenting my documents to someone I don't know declaring that this man is indeed my husband and I would like for you to process my name change not sitting well wit me. For some, it might seem trivial. But for me, it was a bit of a struggle. It seems as if I wanted to hold on to something, I'm not sure what it is exactly, but I just wasn't ready to let it go. In that moment, I turned to my owner's manual for guidance. I like the analogy I heard a while back, just like every car and everything manufactured comes with a manual/guide, so did we, and that manual is the bible. The bible is our owner's manual, It tells you what to do to get the best performance out of your life. Since I want nothing less than the best out of my life I meditated on some passages and found peace with changing my name. Gen 2: 24 That explains why a man leaves his father and mother and is joined to his wife, and the two are united into one. Matt 19: 6 Since they are no longer two but one, let no one split what God has joined together. The verses are pretty much self explanatory, when you get married, you become one flesh and are united into not two but one in everything including you identity. The wife is now identified with her husband. Rom 7:2 For example, when a woman marries, the law binds her to her husband as long as he is alive....changing your name shows a permanent long life commitment to your husband. 1 cor 11:3 But there is one thing I want you to know: The head of every man is Christ, the head of woman is man, and the head of Christ is God. 2 chron 7:14 if my people, who are called by my name, will humble themselves and pray and seek my face and ....Christ is the head of the church and Christ changes your name when you enter into a relationship with Him. Then, you are now called by His name. Same applies to the man as he is the head of the marriage and household. 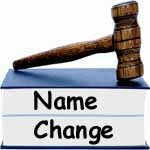 So, changing your name signifies that you agree with the Word, and is to be called by the man's name, as he is the head of the household. Something else I realize is that names are significant to God. In Genesis he spent time naming the sun, moon and stars, the night and day and Adam. Again in the bible as significant changes happened or are about to happen in the life of his children, he changed their names, from Abram to Abraham, Sarai to Sarah and Jacob to Israel. Sounds like name to God is more than just a personal identification, because names convey authority, promises and destiny. This is just another chapter in my life I need to see through in order to continue on this Journey and onto the next chapter. So, I took the first step today by taking a trip to SS office, and I am now officially Mrs. (Hubby). uhm... preach it sister, I can relate to this topic, but I've been over it for years now. Its good you took the first step. It gets better from here.. trust me.